Although most of these songs by Kishore Kumar are thought to be 'fun' songs (well, he was a funny guy. Lata Mangeshkar actually called him Danny Kaye of India for his antics), 'Zindagi Ek Safar Hai Suhana', yes, but then there's the haunting yodel at the beginning of 'Tum Bin Jaoon Kahan', or the morning refresh Yodel from 'Thandi Hawa Yeh Chandni Suhani', or the brooding yodel from 'Nakhrewaali'. Here's a collection of Kishore Yodels from various songs taken from films spanning a period of 1950s to 1980s. Enjoy! Kishore Kumar was a prolific singer so this may well not be a comprehensive list, still: Yodel songs of Kishore Kumar in the order in which they appear in this mix. 'My Name Is Anthony Gonsalves' from Amar Akbar Anthony (1977). one more : a gujarati song "hu amdavad no rikshawalo"
Great find! Seems a fun song. Thanks for sharing! 'aankhen tumhari do jahaan, aanchal tumhaara aasmaan' from Zameen Aasman (1972). 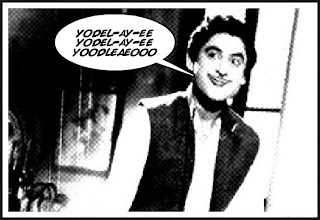 Kishore Kumar Did not introduced Yodeling in Hindi Film Music as written in the article above. But the Yodeling was first introduced in Hindi songs by Mohammed Rafi in the songs "Unse Rippy Tippy Ho Gayee" from the movie "Agra Road" (1957) and "Hello Sweet Seventeen from the movie "Dr. Z" (1959). There are also few other songs in which Rafi had yodelled. Ah! the Great Rafi VS Kishore debate. I did come across Rafi's 'Unse Rippy Tippy Ho Gayee' while writing this post. Fine yodelling by the great man. But i have mention Kishore's yodelling song 'Hich Hich Hichaki Aaye Re' from year 1957 film Begunah. That would mean both greats started yodelling professionally the same year. thank you very much for the list. its very helpfull. i wish u could share the download tinks as well. Yodelling is also prsent in the concluding bars of "Tune Abhi Dekha nahin" from Do Aur Do Panch ,Music Dir: Rajesh Roshan. Rafi saab fans you need not bring the rivalry which never existed between the two maestros in every field. For your information the first proper yodel I can think of is “Aati hai yaad humko January February” from Muqaddar (1950) sung by Kishore Kumar and Asha Bhosle, which happened to be their first duet together as well. Even “Ekdo teen char” from the same movie has some yodeling. But in Kaneez (1949), Kishoreda did yodel in the song “Duniya mein ameeron ko” which was primarily sung by Md. Rafi and SD Batish. The dates are way ahead of the dates in which Rafi saab did yodel.